Photography has changed quite a bit in the last few decades. Back in the days of film, it was hard to add special effects to your photos because that generally required a darkroom. These days, of course, there's no darkroom required. For example, it's easy to experiment with exposure just using your camera's LCD. And that's not all. You probably already know about some photo tricks you can do using photo editing software. Equipped with even an inexpensive digital SLR, though, you can perform some tricks "in the lens," when you take the photo.Consider zoom blur, for example. While zoom blur can be done with an image editor, it doesn't need to be. You can get awesome results by doing it with your camera when you take the photo. Consider this photo of my daughter's prized limited-edition Stupid Fox plushie, for example, which I took using the technique. To take a zoom blur shot, you need to use a digital SLR with a zoom lens—or any camera that allows you to change the focal length of the lens while the picture is being exposed. Alas, most point-and-shoot cameras use an electronic control for the zoom setting that locks while the exposure is taking place. Mastering the Zoom Blur Technique If you have a camera capable of playing along, give it a try. The basic idea: You'll shoot the scene with a somewhat slow shutter speed so you have time to change the focal length during the exposure. Since the exposure will include a range of focal lengths, the resulting photo will be a blur that ranges from wide angle to telephoto. Set your camera to Aperture or Shutter Priority mode and dial in about 1/4 second. There's no one perfect shutter speed, but keep in mind that you'll need enough time during the exposure to move the zoom, but not so much time that the photo is jittery from being held during the shot. Line up your shot, then point the camera at your subject and start zooming with a firm, steady, and consistent motion. Don't zoom too fast, or you will make the camera jerk around—and don't do it too slow, either, or you'll reach the end of your zoom range before you finish the exposure. Just after you start zooming, gently press the shutter release. Just as in golf, be sure that you follow through the zoom motion during and even after the shutter releases. That way, you won't stop moving the zoom in the middle of the exposure, and the overall effect will look smooth and natural. And just as in golf, you will need to practice this a few times to get the shot right. That's all there is to it. You can experiment with different settings—I've found that brightly colored subjects and a simple backgrounds tend to work best—and vary the zoom range and shutter speed to see how they affect the result. 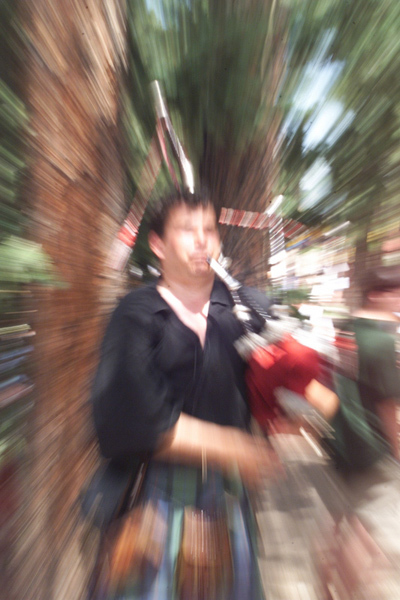 Here's another zoom blur, for example, of a bagpipe player I encountered in a park. If you have a tripod, you can try mounting the camera for support so you don't introduce hand jitters into the shot, and you can use longer shutter speeds without worry. I think that using a digital SLR and zooming with a real lens is the most fun way to try this photo style, but you can always add the effect afterwards using a photo editor as well—which is a good alternative if you have a point-and-shoot. 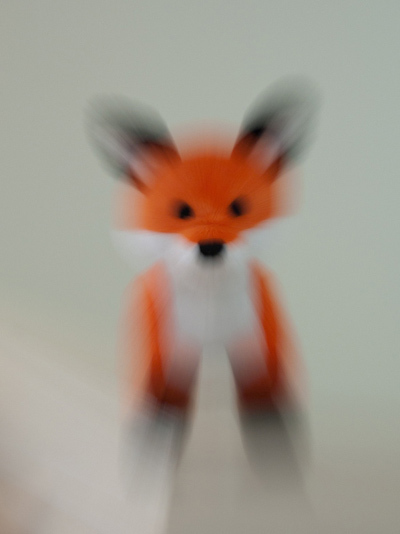 To give it a try, check out the Radial Blur tool. In Photoshop Elements, for example, you can choose Filter, Blur, Radial Blur. In the Radial Blur dialog box, you can change the mode from Spin to Zoom.